A clown has turned himself in to the police after alarm was raised among frightened parents in County Antrim. Police issued an alert after a complaint was made that two men were acting suspiciously near secondary schools in Carrickfergus. Mysterious pictures online of a clown and a balaclava-wearing sidekick have caused a stir in the town. The police appeal caused a backlash on social media from some people who felt they were cracking down on fun. Police said they started an investigation after receiving reports from parents that their children were frightened of the clown. A police officer wrote on the PSNI Newtownabbey and Carrickfergus Facebook page: "Fun is fun but frightening school pupils is another." The mystery man, who calls himself the Carrick "Killer Clown", contacted the police following the appeal to apologise for any distress. "He assures me that this was a prank and it was not his intention in any way to frighten the school pupils or cause distress," the officer wrote. "He fully appreciates the sensitivities of schools and photographs etc in the area of any school." Speaking to BBC Radio Ulster's Evening Extra programme the clown said he had been sent messages from people concerned about their children. "That wasn't the aim. The aim was for a bit of fun. I'm a parent myself," he said. "We thought this was a wonderful idea - to go and get this picture and it was only when somebody voiced their concern I was like 'this is actually wrong, this isn't even funny'. "I was talking to the police officer in charge again. I offered to go to the schools and apologize to the heads, obviously in my plain clothes, and he spoke to the heads on my behalf and they were happy with the apology through the police. So hopefully the parents will get that relayed to them." 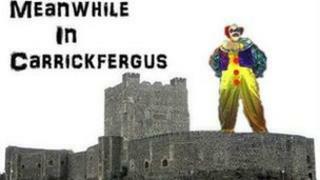 Earlier, a post on Carrick Killer Clowns' Facebook page read: "Due to the mixed response to the school pictures they have been removed - this whole thing is supposed to be a laugh and some parents find this distasteful and unfunny." However, they later posted a picture of themselves standing outside the police station in Carrickfergus.